My wonderful husband kept our Honeymoon destination a secret until the day of our departure (how he kept this amazing secret, I will never know!). He surprised me at LAX by leading me to the Air Tahiti counter, which confused me as I thought we were traveling to one of the Hawaiian islands. When I realized what was happening, I was so overwhelmed that I started crying, and when Max asked why, all I could say was "I don't think Air Tahiti flies to Hawaii." He said that we would in fact be going to French Polynesia, to the island of Bora Bora! We started our journey with an overnight flight from LA to Papeete, Tahiti. It was just enough time to eat dinner, drink a glass of wine and watch a movie, get a night's worth of sleep, wake up to breakfast and arrive to be greeted with Tiare flowers to tuck behind our ears! French and Tahitian are the two main languages of French Polynesia, however many workers at the shops and resorts also spoke English. At the airport in Tahiti, we collected our bags and re-checked them in for the small flight to Bora Bora. Our SCUBA certification cards granted us some extra kilos of weight, but we were still slightly over our limit. Luckily, the kind airport workers let us slide. The flight fron Papeete to Bora Bora was a short 45 minutes. Bora Bora is comprised of a main island (mountainous with extinct volcanoes) circled by a lagoon and then a Motu beyond that that has channels to the ocean. A "Motu" is any tiny island made up of nothing but coral and its derivatives that have been ground over time. The airport is actually located on the Motu and thus all passengers leave the airport by boat! Upon our arrival we were greeted with beautiful pink and white leis. Within minutes we were whisked onto a Four Seasons boat to take us to the resort! Max had another surprise for me - where we were staying! This is a photo of the Four Seasons Resort, located on the Motu and looking out on the lagoon and the main island! 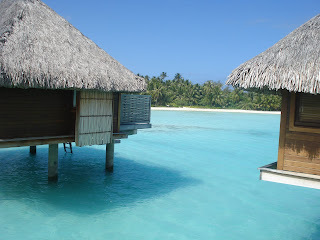 The over-water Bungalows were unreal!! 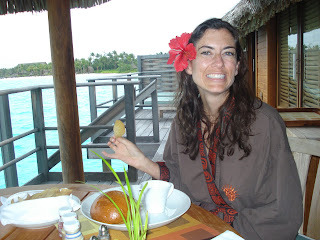 The next item on our agenda: a yummy room service meal : ) From the deck of the bungalow we saw an Eagle Ray swim by! 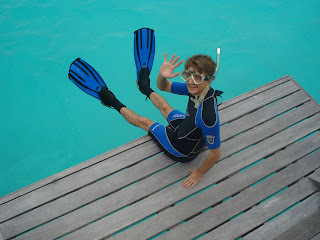 On our first full day in Bora Bora, we wanted to try everything! After a yummy breakfast, Max hopped in a kayak and raced me back to our bungalow. Time to grab our snorkeling gear and hop back in the kayak! Max is tying a bright orange safety vest to the dock so we'll be able to find our bungalow when we kayak back. We kayaked to a lagoon inlet and dove in to find Parrot Fish, Damsels, huge Trumpet Fish, and a Porcupine Puffer Fish (the same kind of Blow Fish we have at home!). Next we kayaked over to what we called our own "Private Motu" in the lagoon - it was maybe thirty feet in diameter, just enough room for us and our kayak! Max even found a random coconut! "I give you this ring..."